I have now moved into Montenegro with a long 8 hour night bus down from Sarajevo, Bosnia. The bus driver asked if I wanted to pay extra to be taken to my destination, as the bus continued to a further destination …? He seemed very keen that I make a decision and pay him sooner rather than later - which immediately raised suspicion. I decided to leave it. Closer to my desired location the price he offered had halved, and I quickly took him up on the deal to get me to the correct town. Otherwise it would have cost me a lot to get back to where I wanted to be, particularly at 4am. I realised once at my hostel that for the driver to drop me off was no detour for him at all… Just a way that the driver clearly tried to make some money-on-the-side each trip. I know he wouldn't have stopped for me otherwise - so was money well spent... Although a shame to have someone clearly trying to gain a bit more money from local travellers. After a couple of nights in Kotor (above) I took a couple of public buses to make it to an orphanage in Bijela (below) called Mladost. I met with Director Mirela and Carer Gora (above), who gave me some background on the orphanage, which has over 100 children and is the only orphanage in Montenegro. 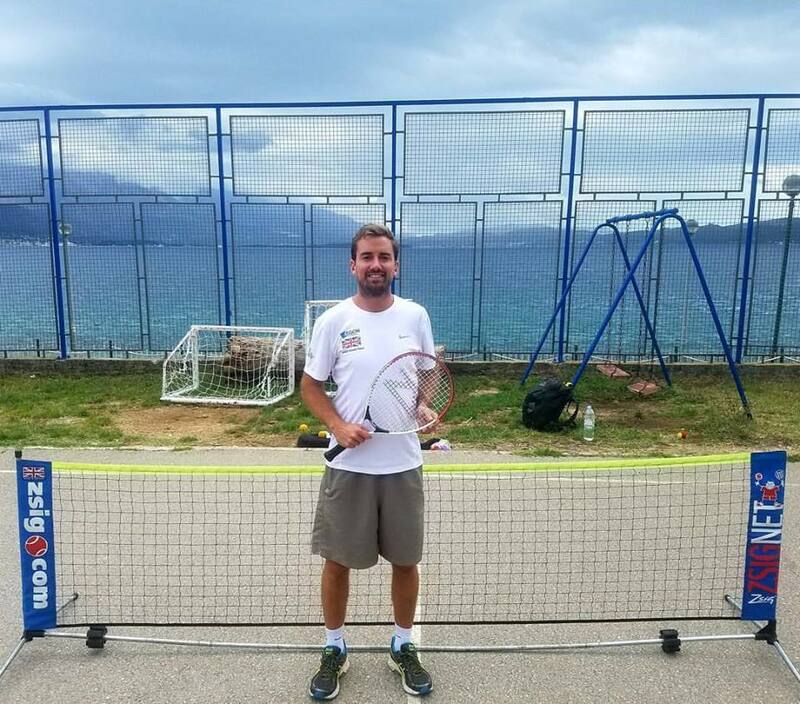 I went on to explain the follow-up of Zsig Sports equipment to Mirela, who was excited at the concept of offering tennis to the children in the future. Goran escorted me down to their sports cage like royalty, where we had an eager class waiting. These children were older that expected, ranging from 12-14yrs, so we made the session more competitive than usual and they were hooked. 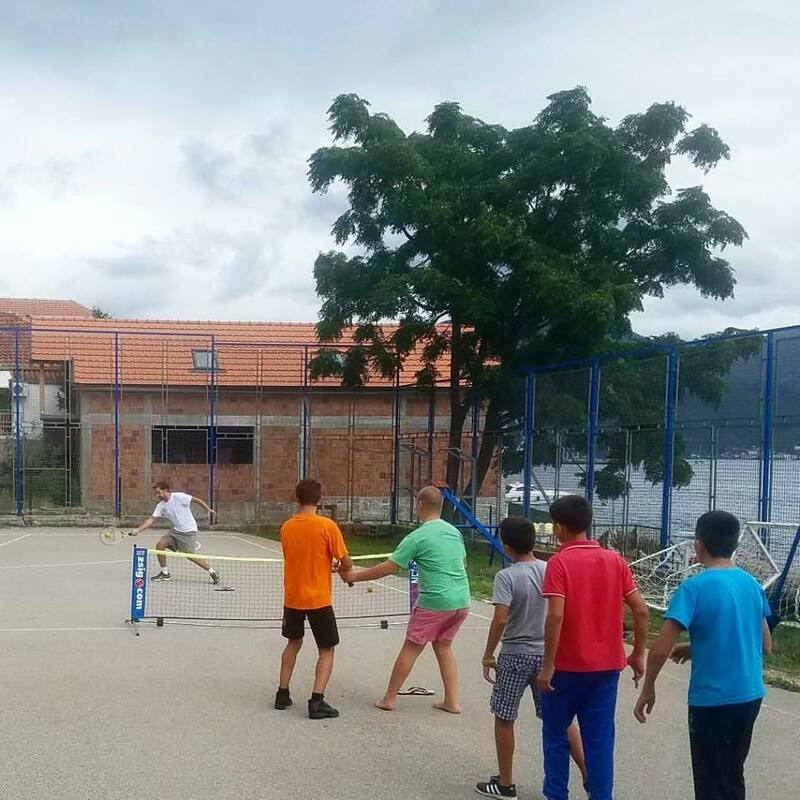 We even got some beat-the-coach in - always good for a personal ego boost… The children started to challenge Goran and myself (below) amd eventually each other with some mini matches, played in great spirit. We were not allowed to take photos of the children faces as part of the orphanages policy, but you get the idea of the setting from the photo’s below. I got a chance to stop off in Croatia on the way back to the UK, and got a bit of a serve pose in outside the airport (below)… There has been a lot of time spent in these air-based transport terminals and a lot of checking-in of the tennis/guitar case. The travel tennis kit is starting to become quite a heavy financial burden, as the rest of my luggage is carry-on, but airlines often stinging me. The RyanAir luggage size checker made us laugh (above). Due to the fact my bag could fit in both the large and small sized carryon limits combines (okay I know doesn't count), I asked if we could take it on as free carry-on... I was politely declined by the airline and I, although smiling, reluctantly paid the equipment check-in fee. Any donations to be able to keep this project going into the next leg will be well received as the tennis/guitar case continues it’s world tour. Next stop. South East Asia!